Waldemar is blown away by the Hayward's new exhibition. Light Show, the exciting new exhibition at the Hayward Gallery, is an event packed with paradoxes as well as goodies, the principle paradox being that light is such thoroughly intangible stuff — so elusive, so ungraspable — yet the dev­elopments explored at this event constitute some of the most tangible in the recent story of art. Much of what art has been up to in recent years will be quickly forgotten, but not this throbbing, blinking, glowing love affair with light. The show brings together two dozen artists who work with different kinds of arti­ficial light, and who usually present their efforts as walk-in experiences and encircling installations. There are lots of dark rooms to enter and lots of curtains to be opened, with lots of full-colour ­surprises bleeping and shimmering beyond. The art under examination comes from all over the map and dates from the 1960s until today. The oldest of the light-lovers, Carlos Cruz-Diez, was born in Venezuela in 1923, while the youngest, Katie Paterson, is from Glasgow and joined us in 1981. Even though she’s the baby of the show, Paterson contributes one of its gloomiest spaces, with a bare light bulb swinging forlornly in a twilit room. The bulb was developed specially by Osram to mimic the effects of moonlight, and the light it throws is dimly spectral and spooky. Cruz-Diez, on the other hand, who is 90 this year, gives us three rooms of outrageously buoyant coloured brightness — red, blue and green — as magical and happy-making as Christmas lights. Thus, the show’s baby is thinking like a grandad, while the show’s grandad is thinking like a baby. Light, of course, has an even longer artistic history than Cruz-Diez. It was created by God in the first paragraph on the first page of the Bible: “And God said, ‘Let there be light,’ and there was light” — Genesis 1:3. It wasn’t until he went on to invent neon signs, LED panels, plastics that glow, strobe effects, disco acrylics, computerised photon sequences and all the other means of artificial illu­mination collected by the Hayward that ­artists were able to create this optical smorgasbord of pulses, blips and washes. Another of the show’s paradoxes is that most of the pleasures it offers are simul­taneously mindless and deep: utterly banal and totally profound. The easiest way to enjoy the exhibition is probably to throw yourself into it with ne’er a thought, like a happy Australian snorkeller diving a coral reef, and to career from intense colour experience to intense colour experience going “Wow”. You may even break some kind of exhibition record for wowing, so varied and numerous are the light ­distractions on offer. But another way to enjoy it, the way I prefer as a gnarled critic who opposes art’s contemporary annexation by the entertainment ­industry, is to ration the wows and to consider instead the show’s fascinating relationship to the art of the past. Artists have always been interested in light. Monet once told an interviewer: “When it is dark, it seems to me as if I were dying, and I can’t think any more.” Whereas Thomas Eakins, the American realist, famously described light as “the big tool”. If an artist could handle light, Eakins thought, he could handle anything. What’s particularly ­exciting about this event, however, is the evidence it supplies of a brand-new relationship between art and light. What modern ­technology has done is enable artists to work ­differently with light — to sculpt it and shape it, to make things out of it, rather than admire it or describe it. I’m pretty confident that the first caveman looking out at his first sunset didn’t feel too differently from me when I walked into James Turrell’s glowing and wonderful Wedgework, from 1974. Yet the sublimely beautiful red fogs presented in his magical red room, edged with delicate purples and framed with slivers of delightful green, could only have been created with the help of modern science and after developments in the phenomenology of perception. Modern technology has ­enabled Turrell to target sublime ancient effects with extraordinary precision. Where a sunset by Turner is a messy invasion by ground troops, a Turrell installation is a precisely targeted drone strike. For a clear example of the expert sculpting of light that art can now achieve, you could hardly improve on Anthony McCall’s solemn and glorious You and I, Horizontal, from 2005. You walk into a dark room and slicing the air in front of you are intersecting beams of white light, with surfaces as flat and hard as a Formica worktop. You know it’s only light, but it seems so solid that your body is actually reluctant to walk through it. It’s a magni­ficently disorien­tating perceptual effect, made even more engrossing by the lovely geometric ­drawing being traced on the far wall by the projected beam as it moves. First it’s an oval. Then it’s a valley. Then it’s a valley and a mountain. The light that just felt as solid as marble is now drawing on the wall as delicately as a feather. As if that weren’t enough paradoxes for one event, the show slips in a final non sequitur by achieving some of its rarest and most delicate effects with cheap and common materials. Witness the entire output of Dan Flavin. I send my car for repairs to a garage that has fluorescent lights in its workshop exactly like the ones that Flavin arranged along the wall in 1963, creating a beautiful piece called The Nominal Three. In my garage, the fluorescent lights sting your eyes with their relentless throbbing; in Flavin’s hands, this same fluorescent whiteness takes on the crispness of freshly fallen snow, the innocence of a first-communion outfit, the ethereality of an angel’s robes. 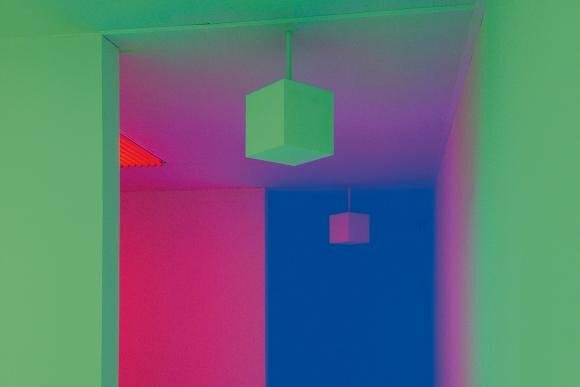 All this is memorable and impressive: what superb optical alchemy it is that makes something so magical out of Flavin’s fluorescent tubes, or McCall’s smoky cinema effects, or Turrell’s arti­ficial sunsets. In the hands of these grand old ­masters of fluorescence and projection — they all came into their own in the 1960s — artificial light achieves the depth and profundity of nature’s best effects. Less impressive are the show’s attempts to widen light’s emotional range by involving it in politics as well as sublimity. Jenny Holzer, that stuck record of an artist, has a word work here, Monument, made in 2008, in which a seemingly endless succession of words and phrases associated with the invasion of Iraq circles and pulses unstoppably around a 14ft column of LED throbbings. The throbbing lights are coloured red, white and blue, the colours of America. This, then, is light exhibiting the ­sensitivity of a bulldozer. A few of the artists seem to have spent too long at the disco, as well. The first work you see here, Cylinder II, by the New York artist Leo Villareal, is another column of flashing and throbbing LED spangles, which, according to the text on the wall, reminds us of snowfall and meteor showers. No it doesn’t. This is the kind of relentless nightclub throbbing that needs a disco ball above to complete it, and a dancing Travolta below. So it doesn’t all work. But most of it does. And the end result is an engrossing, original and provocative display.